Chicks and you Dudes may not think alike, but we are all looking for the right route in our relationship(s)… the directions to get us from point A to point B. If Google Maps had relationship directions, which option would you choose and which one are you taking? DYNAMIC – A route that is learned by routing protocol, through a sharing process (influenced by others). Business (paper) – If you filled out a dating questionnaire this person would be spot on. You may have no personal or sexual connection even though you get along well. Things are boring and repetitive. Mainline (parent) – You found someone just like your Mom/Dad, take the same path they did, and mirror it. Special (child) – This is similar to the parent route, but forms a loop of the more dominant parent route. You are basically detoured by taking several other routes first, but have ended up in the same place. Historic – You meet and marry your high school or college sweetheart, limited in exploration, but romantic. Follower – You are completely influenced by others and may not care to have a route, but take the path where life brings you, sticking to the heaviest flow of traffic. This is your “most popular” route, making no decisions yourself. STATIC- A route that is created by the administrator (you). Scenic – You meet someone who is a “fit”; you do fun and adventurous things together. You may divert for a while and take other routes, maybe with one of you go off the path at times, but it is always fun. Bypass – You just can’t find the right way, so you follow no direction but take your own path alone missing out on all sorts of possibilities. Alternate – The unconventional. Maybe you go in circles, or it doesn’t make sense to anyone else, but you like it. You’re content to just find your way, moment to moment with no worries. 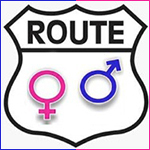 A woman is more likely to take a Dynamic route (unless you’re me), while men opt for a Static route. Men don’t ask for directions… the oldest stereotype in the book. This comes from an insecurity of never wanting to feel helpless. He is a man after all; his survival instincts will kick in. He also doesn’t want to be vulnerable to other people. However, Men will follow maps and team up to find the right way; if you’re a team member then you are useful. It is like a sport… men like teams. If you can read the map and tell him where to go (NOT your personal opinion) you’re a good team member. (A map of your body with directions, is good too). You may have to go down several routes before you find the one that is best for you. Just make sure you have the right traffic on the road and, when you get to point B, the right Dude or Chick parking in your garage.